Bob Brier, senior research fellow in the Department of Philosophy at Long Island University’s C.W. Post campus, gave the first Stuart L. Wheeler Gallery of the Ancient World Lecture, sharing his first-hand research on the ancient Egyptian process of mummification. The lecture, which the University of Richmond classical studies department hopes will become an annual event, was named for the gallery former professor Stuart Wheeler established in 1979 as a teaching collection within the department. The antiquities on display in the gallery were once exhibited in a small Richmond College museum, before the university moved in 1914 from its downtown location on Lombardy Street to the city’s West End. Among the collection’s treasures is the mummy and sarcophagus of Ti-Ameny-Net, which were just some of the Egyptian items brought to Richmond by Dr. J.L.M. Curry in 1876. The gallery grew out of a broom closet and into a proper, if still small, gallery space with donations by alumni, especially the estate of Mae Keller, who was the first dean of Westhampton College, as well as through the generous benefaction of Mrs. Gertrude Howland, who attended Westhampton College and has supported the field of archaeology for a lifetime, through her fieldwork and service in the Archaeological Institute of America. Classics and archaeology professor Elizabeth Baughan, who is also the curator of the Ancient World Gallery, came up with the lecture as a way to enrich the gallery’s educational potential. “The idea is to bring in lecturers who can provide context for the works in the gallery or who have a special interest in the process of making ancient art, which was a personal love of Stuart Wheeler,” Baughan said. Brier was an easy first choice to fill that role—one of the world’s foremost experts on mummies and Egyptology, he is known to some simply as “Mr. Mummy.” He earned his undergraduate degree at Hunter College and his M.D./Ph.D. 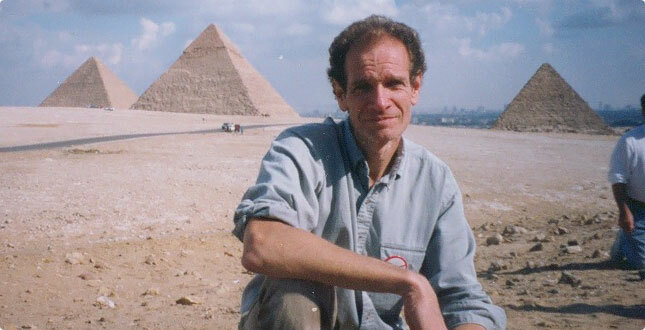 in philosophy at UNC-Chapel Hill and has authored numerous books on Egyptology, including The Murder of Tutankhamen and, most recently, The Secret of the Great Pyramid. “Bob Brier’s visit exceeded all my expectations,” said Baughan. “He spent time looking at all the Egyptian objects in the gallery, not just the mummy, and gave us so much information. I took pages and pages of notes that will support new labels and informational displays and have already spawned new ideas for interactive exercises for visitors of all ages, like a mini-lesson in hieroglyphics based on the name written in many places on the mummy-case.